The NTSB issued the photos as part of a preliminary report on the March 15 collapse that killed six people and injured eight others. Large cracks appeared in a pedestrian bridge less than a week before it collapsed near Florida International University earlier this year, according to new photos released by federal safety inspectors on Thursday. The National Transportation Safety Board issued the photos as part of a preliminary report on the March 15 collapse that killed six people — five vehicle occupants and a bridge worker — and injured eight others. The new photos that show significant fissures in the concrete were taken after March 10, when the prefabricated bridge was taken from a casting yard and set into place on permanent piers, according to the NTSB report. The university celebrated the unveiling of the walkway on March 10, five days before it collapsed. The federal agency had previously released other photos, taken on Feb. 24, that showed smaller cracks at the ends of the 174-foot-long bridge. NTSB officials have interviewed employees from eight firms and organizations involved in the design, inspection and construction of the bridge, the agency said in a news release accompanying its report. The report did not include the results of those interviews or its tests of materials and equipment. 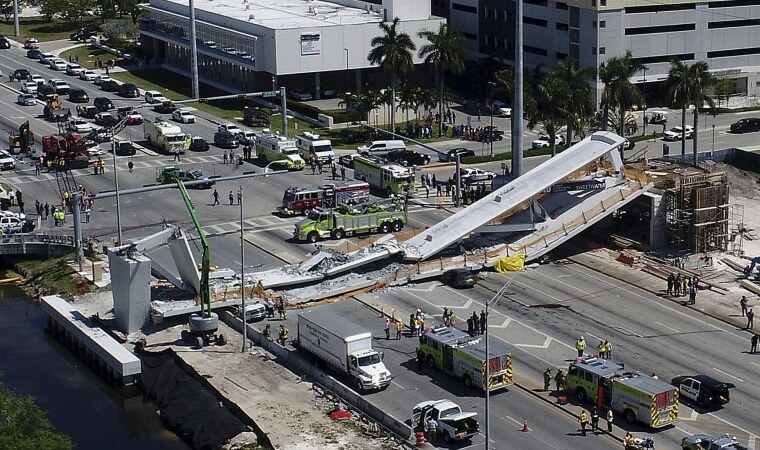 Several vehicles were crushed when the bridge, designed to span a busy highway and withstand hurricane-force winds, came down near the Florida International University campus. The planned walkway connected the campus to the town of Sweetwater, where the university estimates roughly 4,000 students live. It was expected to open in early 2019.